Those were my thoughts walking out of The Second Best Exotic Marigold Hotel where I had just been charmed by Dev Patel’s enthusiastic dancing and, in all honesty, that’s essentially where my thoughts stopped. It’s a nice film but, in large part due to it being an unnecessary sequel, it’s a familiar one. We’ve met all of these characters, and barring a charming Richard Gere, there’s no fresh blood to offer up. Instead we’re welcomed into a charming visit with these characters we met in 2012 who left to escape their bleary British towns and instead ended up a journey to find themselves in their older age. If this film poses any questions that aren’t simply redundant at this point, it’s the film’s frank look at age and the abrasive acknowledgement of time that one has when you reach the point where there needs to be a roll call in the morning to assure the plucky hotel owner that you’re still breathing. 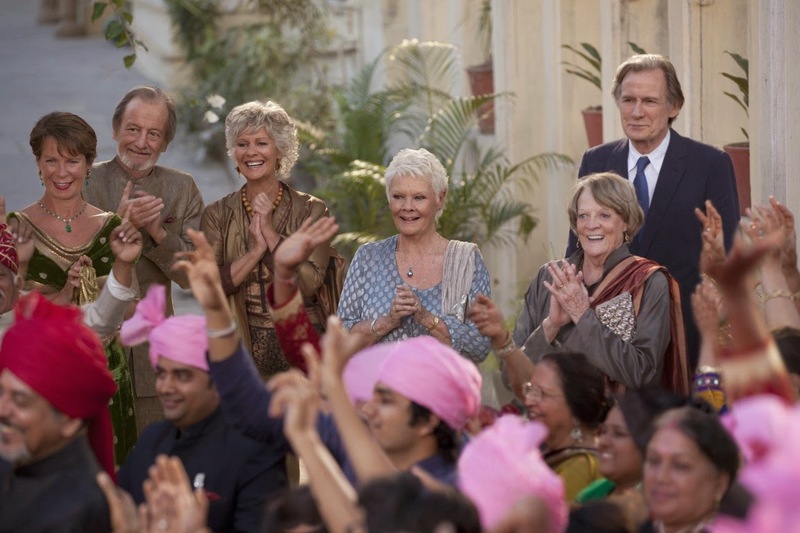 Something of a sleeper hit The Best Exotic Marigold Hotel’s success essentially solidified a need for a second, and with a cast so rich in talent and history, it’s hard to pass up. The story picks up with Sonny (Dev Patel) wishing to expand his franchise, which is lead by him and his business partner Muriel (Maggie Smith). Evelyn (Judi Dench) has taken up buying cloth while she keeps up a flirtation with Douglas (Bill Nighy), who is conducting tours now, but neither has moved much further in their relationship since we last saw them in the first film. It’s a sweet romance and one that would have benefited from more screen-time. Dench is a legend, and I don’t think there’s an actor alive who can touch the “cool” factor that Nighy effortlessly possesses. It’s also worth noting how infrequently people their age are allowed to play roles as leads in a romance; so considering the demographic for this film, it certainly would have been a smart move as well. Madge (Celia Imrie) and Norman (Ronald Pickup) are dealing with the notions of settling down at their age, what it means, and if loneliness can be conquered no matter how old you are. This is all well and good, but it also has to split the focus with Sonny’s nuptials that begin on a downward spiral and continue that way for most of the film, along with his mother’s romance with Gere’s Guy. It’s a lot to pack into a two hour film that by its third act has overstayed its welcome. A little trimming by screenwriter Ol Parker and a little more confidence in who the story is about—rather than a need to showcase every character as much as they can—would have been a quick and easy fix to a film that’s enjoyable but spread thin. The film is sweet, and it offers another version of a story we’ve heard before, refusing to allow age to dictate the worth and energy of a role. However, to get to the movie’s sweeter moments, I need to address the biggest issue: this is so very much a Western look at India. Befitting to the title, it’s a vacationer’s look, where every aspect of life is new and holds possibilities. It’s the Hollywood version where older white people can move in and adapt and change those around them. It’s unsubtle and mildly distracting to the overall enjoyment of the film. While not the brightest part of the film (that would be Smith), I couldn’t help but leave the film (and then the next night, leave Chappie) wondering just why Patel doesn’t have a greater career. He’s young, starred in an Oscar winning movie and is talented. Patel carries a lot of charm, which makes Sonny’s more grating antics bearable (and his character is written annoyingly) because as an audience, we enjoy watching him. I can’t help but cast a cynical eye on his trajectory so far because there’s no reason why he shouldn’t be called in for the same parts that actors such as Logan Lerman, Miles Teller, Ansel Elgort and co. are being offered. It’s frustrating and another case of Hollywood missing their mark. That being said, in a film that didn’t exactly have anything new to offer in terms of relationships, I was very fond of Patel and Smith’s rapport, so much so that their mutual affection for one another was almost instantly believable. His youthful exuberance playing opposite her world weary ways is the obvious note to play but coupling that with a genuinely touching chemistry where his excitement and naivete play off of her equal curiosity and warmth is where the film shines. Also great (and everything Smith does in this film is great) is Dench and Smith’s relationship where the two legendary actresses get to play off of one another with such naturalism that you wouldn’t be surprised if they’d been acting together their entire lives. The film is shot beautifully by director John Madden, and it’s a respectable and lighthearted film that plays with some weightier tones. It’s nice. The Second Best Exotic Marigold Hotel is out in theaters now.